Jimmy the Dope Dealer has nothing to fear from the government pot store, he’s going to be in business for quite a while still. Despite claims by Justin Trudeau and his Liberals that legalizing pot is about taking it out of the hands of organized crime and keeping it out of the hands of our kids, I don’t expect much to change. While Trudeau had a real chance to make pot activists and libertarian leaning folks happy with his pot promise, the actual rollout means little will change. The federal legislation on marijuana is a bit like Frankenstein’s monster, it is cobbled together from many parts and is pretty ugly. The provincial roll outs, such as we’ve seen in Ontario, aren’t any better which means job security for Jimmy the Dope Dealer. I asked listeners to my radio show the other night, and my followers on Twitter, whether they would buy pot at the government store if they could buy it from guys like Jimmy cheaper. Serious question for pot smokers. If the government store charges $10/g & your dealer cuts their prices to $7 where would you buy your pot? The responses online and from callers was amazing. While many would opt for the government store citing issues such as quality or convenience, many more stated they wouldn’t use the government store for the same reasons. Long time pot smokers said they trust the suppliers they use now and wouldn’t want to switch. Ontario plans to use a government liquor store type approach, although instead of the temples to booze we have now with beautiful displays and sampling booths, the Wynne government wants to take us back to the 1970s era Liquor Control Board stores. No picking up products to smell or feel, in fact you won’t be able to even look at the product. Like the Ontario liquor stores I remember from my childhood, you will place your order with the bureaucrat at the counter who will then fetch your stash. Oh, and it will cost about $10 a gram plus, I assume, HST of 13%. So $11.30. Jimmy doesn’t have to worry about losing market share. In the above mentioned tweet I asked about local dealers charging $7 a gram. Some contended that was an unsustainable price but I’d beg to differ. 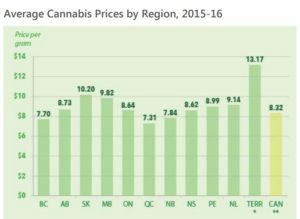 Not only could I find medical marijuana for sale legally in Canada in that price range but a study by the Parliamentary Budget Office on marijuana found that the average price in Quebec over the past two years was $7.31, in BC $7.70 and in New Brunswick $7.84. The average Canadian price on the street from 2015 to 2016 was $8.32. If Ontario is charging an average of $10, does that make sense? I may not know much about pot but I do know human nature. Consumers used to dealing with people they already know will most likely opt for the lower price from someone knowledgeable about the product rather than going to the government store staffed with bureaucrats. And if dealers, backed by organized crime to be sure, can make a fortune with pot while selling as low as $7.31 a gram right now, you can bet they will find a way to cut prices by increasing productivity or finding efficiencies in their operations. We haven’t seen the plans from the rest of the provinces yet but suffice to say that if the others follow the lead of Ontario, Jimmy the Dealer and his friends truly won’t have anything to worry about. Ontario will start off with just 40 stores in July 2018 growing the pot bureaucracy to 150 stores by 2020. There are more than 400 municipalities across Ontario and the province expects to take out the black market with 150 stores that will operate on LCBO terms, have higher costs and be shut down by 9 pm. No doubt many people will use the government stores, but you can be just as sure that under these plans and these prices, many more will keep visiting guys like Jimmy down the street. If you buy from someone you know, you might be able to find out if pesticides were used on it. It is not only about the cost of the marijuana that will keep people going to the dealers. It is more about the level of THC in the product. Gov’t produced mahijuana will have strict guidelines to the level of THC being sold. The underage acquire alcohol through legal age adults and other outlets, this will be no different with marijuana. Gov’t controlled cigarettes has not prevented contraband cigarettes. The truth is that is all about the tax revenue that will be generated and has nothing to do with the health and welfare of Canadian citizens. 10 bucks a gram is $280. an oz. plus tax. Here is BC an oz is currently going for about 120 to 140 … and no Fn tax. Do the math and try not to laugh at the stupidity of our leadership. I’ll only buy from the government if it’s AAAA quality for $100 an oz. I pay $150 from an advertised delivery service now – $100 for lower grade. $100 an oz is enough for the government to make money, and put a huge dent in organized crime. It’s far more compassionate to patients/customers too. Liberals are gouging at $10 a gram plus tax. I could buy an oz from the delivery guy and more than double my money if I resell at that rate.